No contest, and no question as to the better team, as St. Henry runs past a diminished Delphos St. John to open MAC play with an easy win. 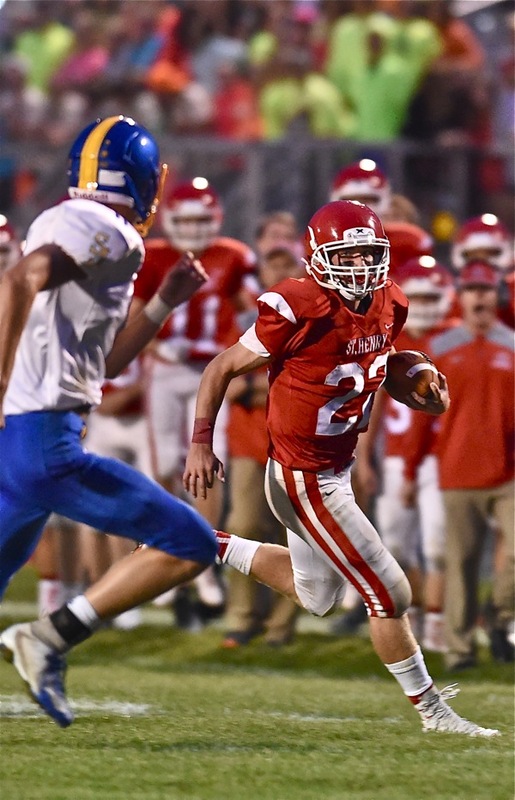 St. Henry – Twelve quarters into the 2018 high school football season there’s little question as to coach Brad Luthman’s modus operandi with the St. Henry Redskins. They’re gonna’ run – run left, run right, and right up the gut. And behind 310 pound left tackle Caden Niekamp, a Division I commit to Ball State next fall, there’s been little any of their opening three opponents could do about it. 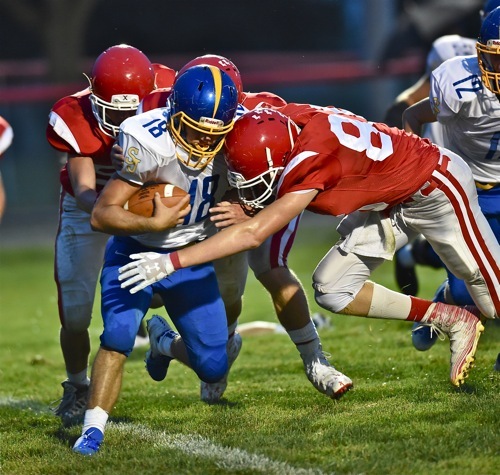 Friday night they added the Delphos St. John Blue Jays to the list, outgaining the Jays (1-2) 375 total yards to 31, with about half of their 375 yards owing to the work of senior tailback Zach Niekamp. Niekamp ran the ball 18 times for 147 yards and four touchdowns and played one series in the second half. 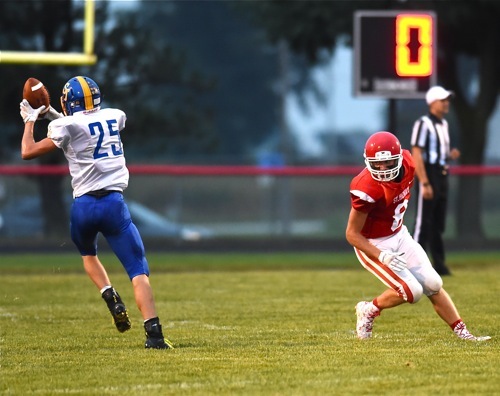 St. Henry scored on their first possession of the half and from that point the clock ran continuously as the weekend rain gathered momentum. Final score: St. Henry 37, St. John 7…and it wasn’t that close. St. Henry scored on its first possession of the game, at 7:45 of the first quarter on the first of Niekamp’s touchdowns, from 4 yards out. But at 4:46 of their next possession, St. Henry quarterback Sam Lefeld misfired to wide receiver Ethan Thieman, throwing behind Thieman, and into the waiting hands of St. John safety Curtis Schwinnen. Schwinnen waltzed for 28 yards into the end zone and a ‘pick 6’, what amounted to be the Blue Jays only score of the game. Tied at 7-7, St. Henry pinned St. John on its own one yard line with a Sam Lefeld punt to open the second quarter, and on St. John’s second play from scrimmage the ‘Skins trapped the Jays’ Peter Ankerman behind the goal line for a safety to take a 9-7 lead. 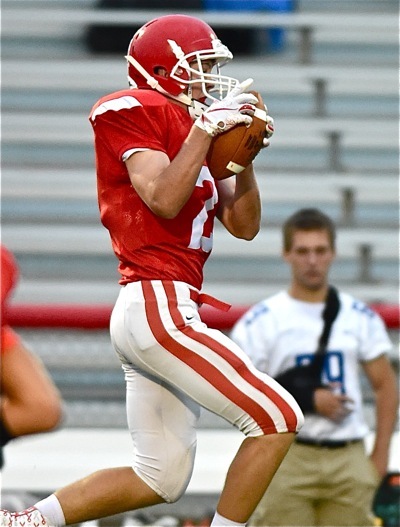 Three minutes later, after receiving the ball via the safety, Niekamp scored the second of his touchdowns from three yards out to give St. Henry a 16-7 lead. They still haven’t given up a point…St. Henry’s defense stops St. John’s Peter Ankerman behind the goal line for a second quarter safety. St. John, in the meantime, could not move the ball. Hampered with injuries and facing a defensive front that was stronger and more athletic, quarterback Isaac Fairchild threw an interception to St. Henry’s Jay Knapke at 6:20 of the second quarter and four plays later Niekamp rang up his third score from 6 yards out to make it 23-7. At 2:10 before the half the Redskins got the ball for a final time in the half, drove 58 yards, and you guessed it…Niekamp scored again with 30 seconds remaining to increase the deficit to 30-7. The bands came out for halftime and St. John coach Todd Schulte probably wished they had played all night; because on their first possession of the second half St. Henry marched the length of the field to score for a final time…an 8-yard run by Cody Bruggeman to close things out 37-7. From that point on the game clock ran continuously, and it took just 24 minutes, exactly, to finish. For the third time in as many weeks, the name of the game for the Redskins was to run the football – against Covington, against Eaton , and against St. John. And with Caden Niekamp and that formidable offensive line, they leave little to the imagination that they intend to do that for the next seven weeks, as well. But lest anyone load the box on them, consider…quarterback Sam Lefeld had his moments, completing 8 of 11 passes for 127 yards. His only blemish was the first quarter interception for St. John’s touchdown. St. Henry’s Jay Knapke stops a St. John possession with this first quarter interception. But the defense was equally impressive. No, St. John wasn’t at full strength, but to hold any team to 31 yards by running to the football is a measure of its ability to execute. “We are happy with what the defense has done,” said Brad Luthman. “We haven’t had the whole slate thrown at them because tonight Delphos was a bit limited, but we’re pleased with the way they’ve played. Niekamp’s emergence is somewhat ironic, given that he’s a late bloomer at the position. St. John’s Curtis Schwinnen picks off and returns an errant first quarter pass for the Blue Jays only score. Is the jury still out on St. Henry? Absolutely, as the cumulative record of their first three opponents is 1 and 8. But when you can run the ball football becomes a game of will and perseverance, and the game gets shorter. Limit the other teams’ possession and the odds are even more in your favor. It’s Anna’s turn next week, followed by New Bremen and then the heavy lifting…with Marion Local. By that time the jury will have a verdict. And if they prove they can still run the ball…it paints a whole ‘nuther picture for post-season football in 2018. Suddenly Division VI becomes very, very crowded!